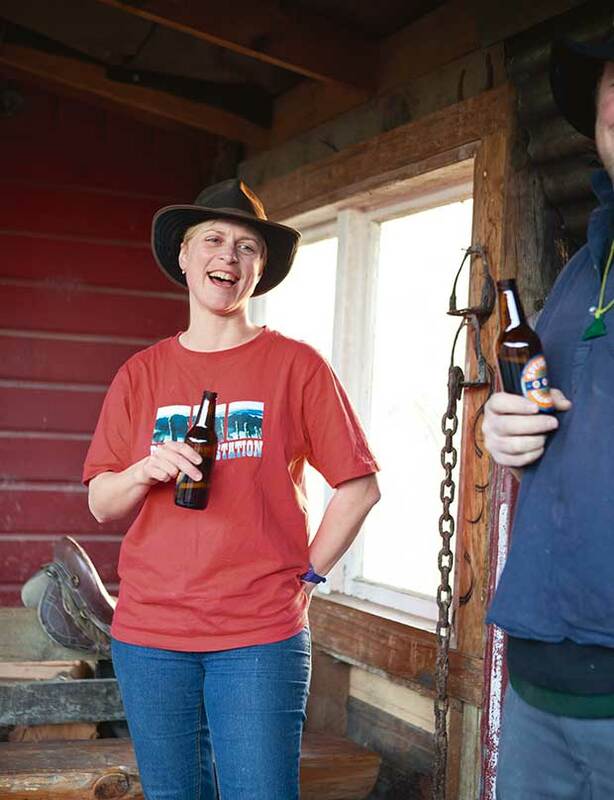 A typical day at Blue Duck Station comes to an end with a debrief for Dan and staff Maggie Christie, Dan Bentley and Wendi Lane at Whio Lodge, the station’s renovated shearers’ quarters. 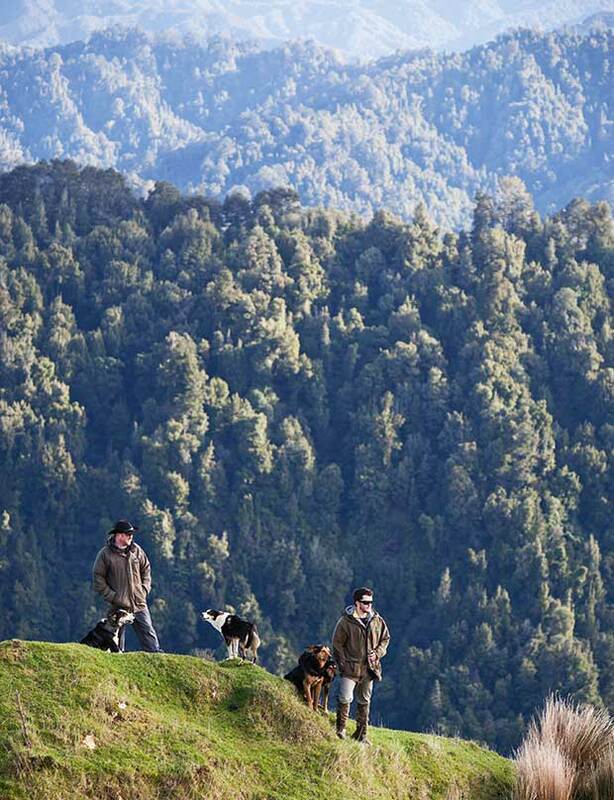 Fortunate indeed are the endangered creatures flourishing under the protection of a family that has figured out how to combine farming with eco-tourism. Dan Steele is a farmer, conservationist, competitive axe-man, hunter, historian, lodge host, rugby fan and romantic fiancé who never dreamed he’d turn into a bird geek. 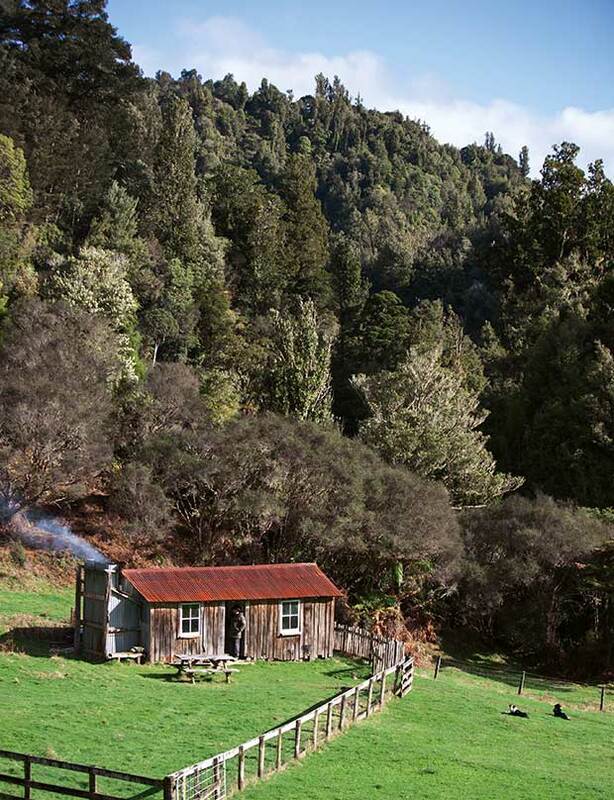 But at the age of 21, while wandering up the banks of the Kaiwhakauka Stream at Retaruke Station, his parents’ remote property at Whakahoro south of Taumarunui, he spied a family of blue ducks (whio) and they unwittingly shaped the rest of his life. 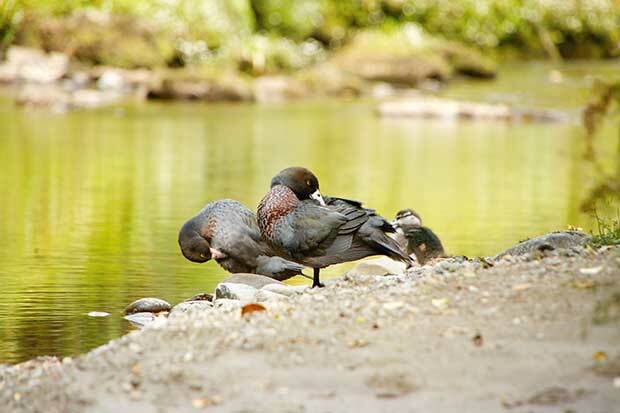 A precious moment – two adult whio and a juvenile are spotted on the banks of the Kaiwhakauka Stream. Our young eco-warrior-in-the-making then headed overseas for several years where he reviewed his life to date. There had been an agriculture degree at Massey University and a stint as a stock-firm auctioneer. Based in London, he worked at attaching steel grilles to the windows of buildings occupied by squatters. “I thought about the poor buggers who lived in these spaces with the worst form of drug dependency, no goals, no passions. It was a real eye-opener. I realized the great contrast of places in the world and the quality of people’s lives. 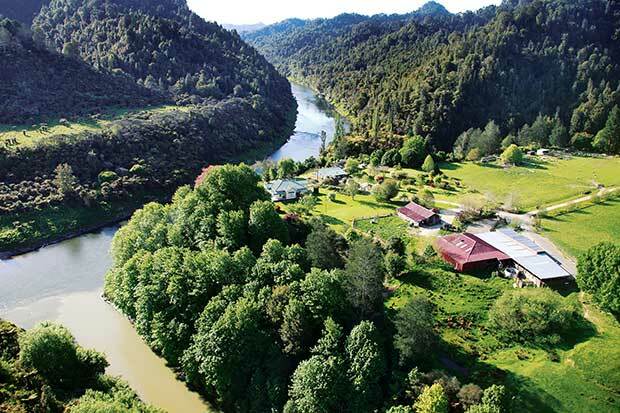 “Greece was a great party place but how could you compare a bunch of white houses on a rock with the beauty of the bush up the Whanganui River? And in Las Vegas every second person seemed to have a throat tattoo. I wondered about their lives. What were they thinking? Sandy and Blue with four-legged friends Buck and Bub. Back in Aotearoa he worked on his parents’ farm with a burgeoning sense of conservationism – an attribute inherited from his mother Rachel. 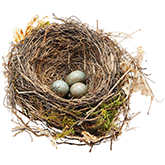 “Mum has always been right into ecology, the birds and the bush.She was always pointing out flora and fauna to us when we were young. She sees the beauty in lots of natural things. Alongside mustering, drenching and shearing at Retaruke Station, Dan trapped rats, stoats and possums. He shot goats, wild cats and deer and mused about setting up a business model merging farming with a massive conservation project. He thought it might also tickle the fancy of travellers and tourists. 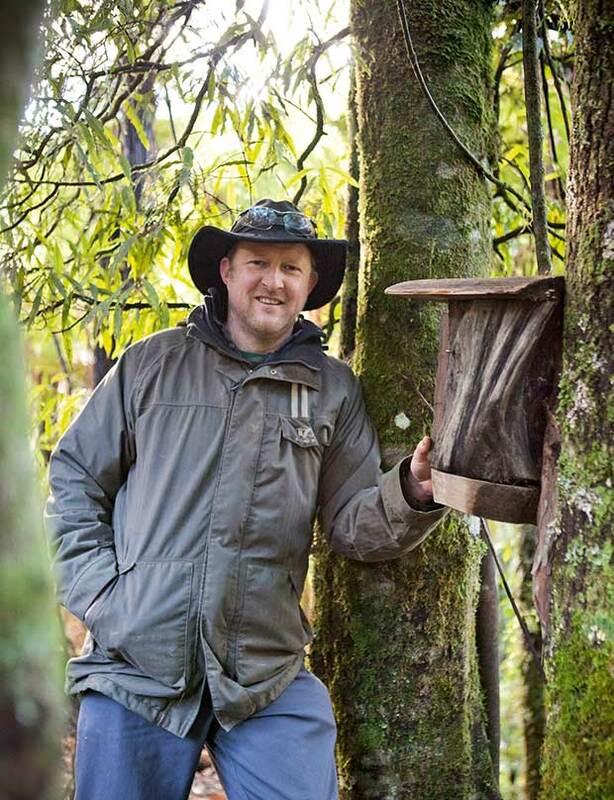 Dan checks one of the weta boxes designed to help restore the native weta population. Weta numbers across New Zealand have plummeted because of cats, rats and hedgehogs. Seven years ago he stopped pondering and began practising. A block of farmland came up for grabs across the Retaruke River next door to his parents’ place, bounded by the Whanganui National Park. Dan secured the property and named it Blue Duck Station. Additional land has since been added and Dan has hit his straps with a double-banger operation. On the other half he’s a fervent conservationist. Even a bird geek. 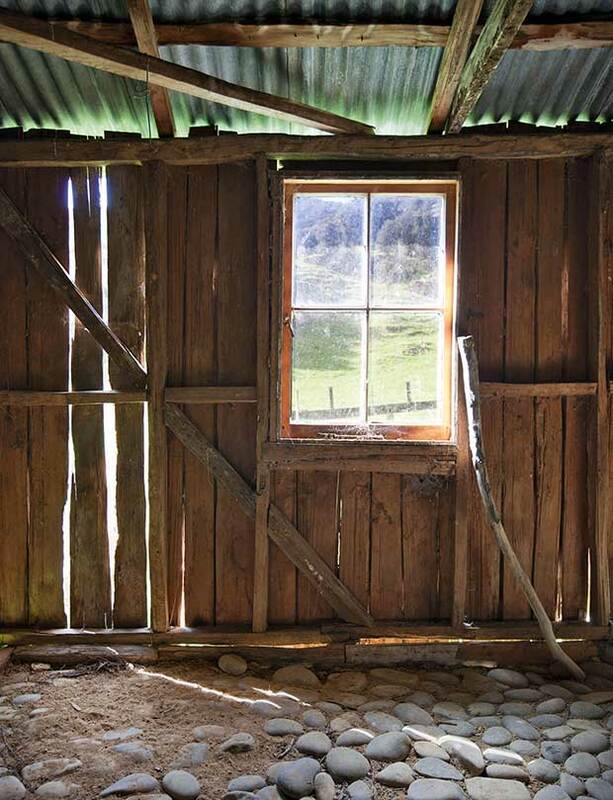 Eight hundred hectares of land have been left to regenerate, 450 predator traps are in full swing, six kilometres of fencing have been built along streams and rivers and a cluster of historic dwellings – remnants of the era when World War I returned servicemen tried in vain to farm the nearby Mangapurua Valley – have been preserved. 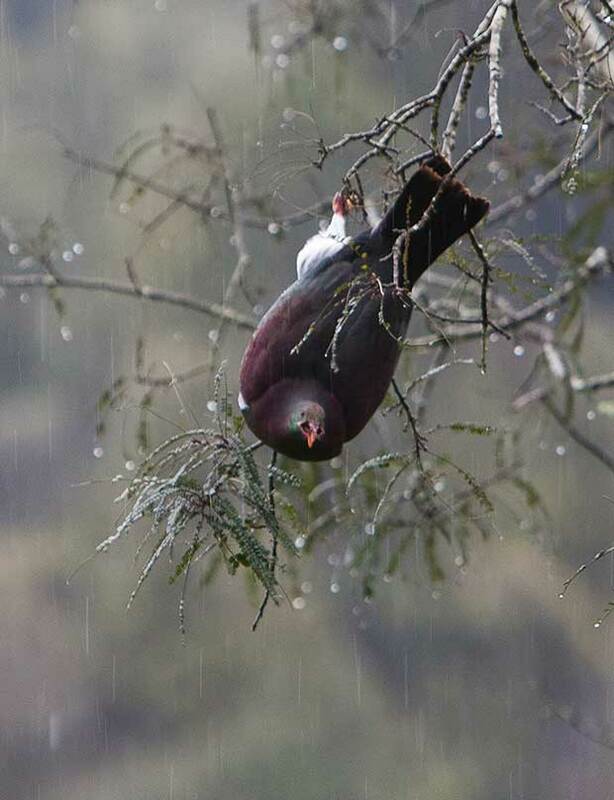 A kereru frolics in a kowhai – once a rare sight, now a regular occurence. Dan says the forest canopy and bush are reviving, water quality in streams is improving and natural wildlife is returning. “The indicator species are bouncing up. We’re seeing big flocks of tui and kereru again. I’ve seen 50 tui in a flowering kowhai.” The station is now home to eight pairs of whio, one of the highest concentrations in New Zealand. It also has strong remnant populations of brown kiwi, native bats, native fish and weta. 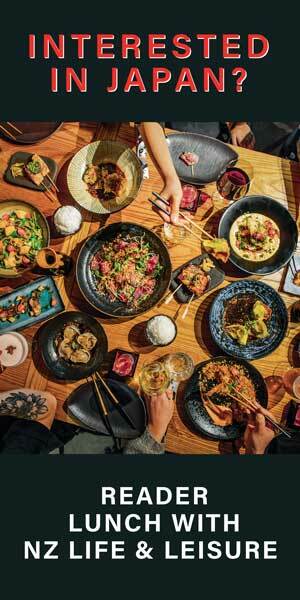 While Dan is buoyed by the success at Blue Duck Station, he has a big-picture vision. He sees environmental protection as a hefty economic driver. Sandy and Dan with Blue and sheep dogs Buck and Bob in front of the historic home they are renovating at Blue Duck Station. Doing the business is undoubtedly a Dan Steele approach. 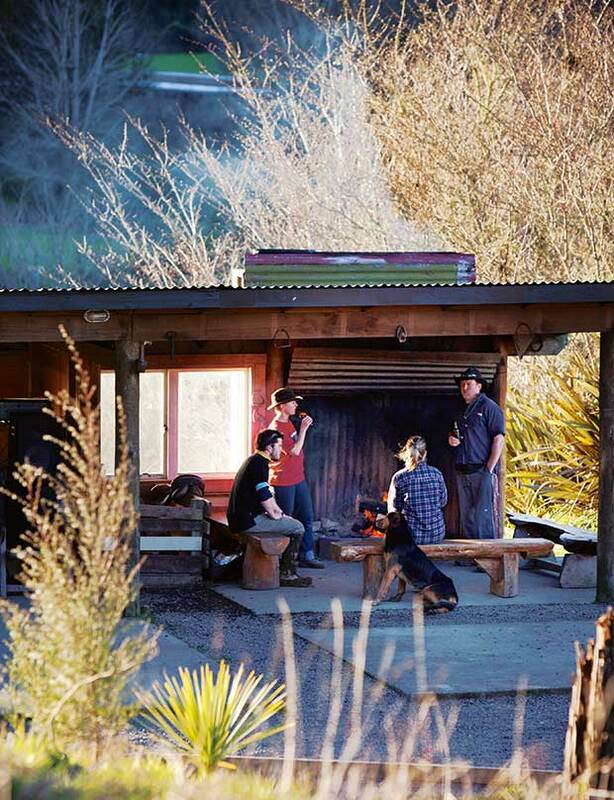 In his first year at the helm of Blue Duck Station he built a rustic, self-catering lodge in a clearing above the banks of the Retaruke River to accommodate guests eager for total immersion in heartland New Zealand. 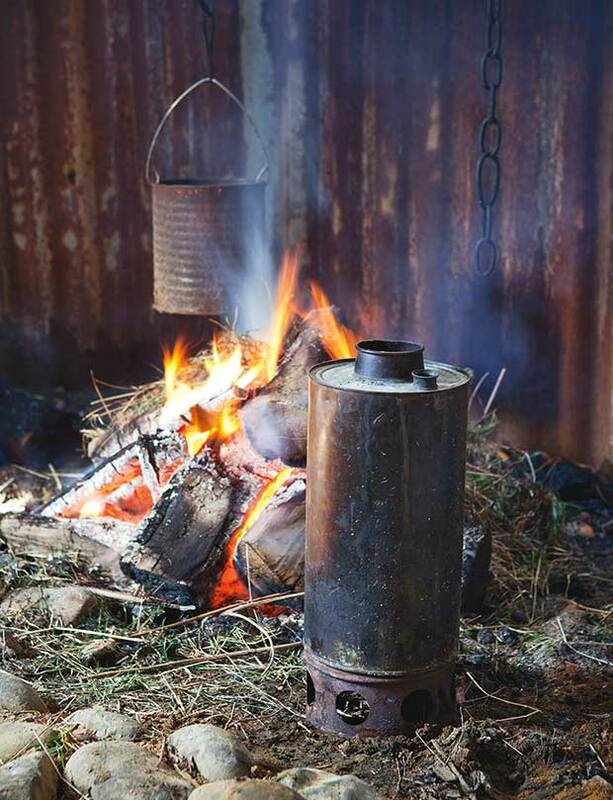 Hunting, horse-trekking, kayaking, biking and bush safaris were the menu offerings. With nearby Whakahoro on the Retaruke River the entry point for canoeists starting the three-day Whanganui Journey Great Walk and the knowledge that the Mountains to Sea Nga Ara Tuhono leg of the New Zealand Cycle Trail network would cut through Blue Duck Station, Dan upped the ante. 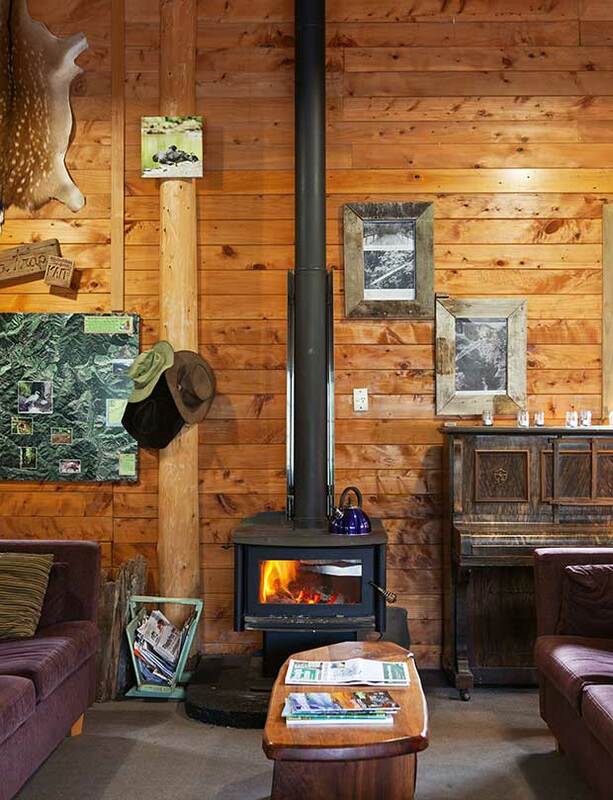 Several old cottages and the shearers’ quarters on the property were renovated for guests and a purpose-built café opposite the Whakahoro Department of Conservation camp-site was added to the mix. But something much bigger than a bevy of mountain bikers was on its way to Blue Duck Station. 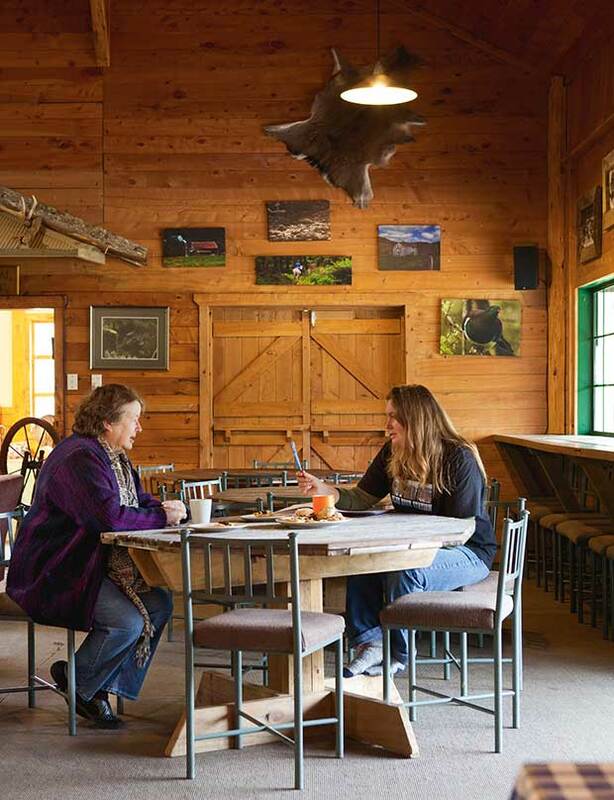 Dan’s mother Rachel and lodge manager Wendi catch up over coffee. 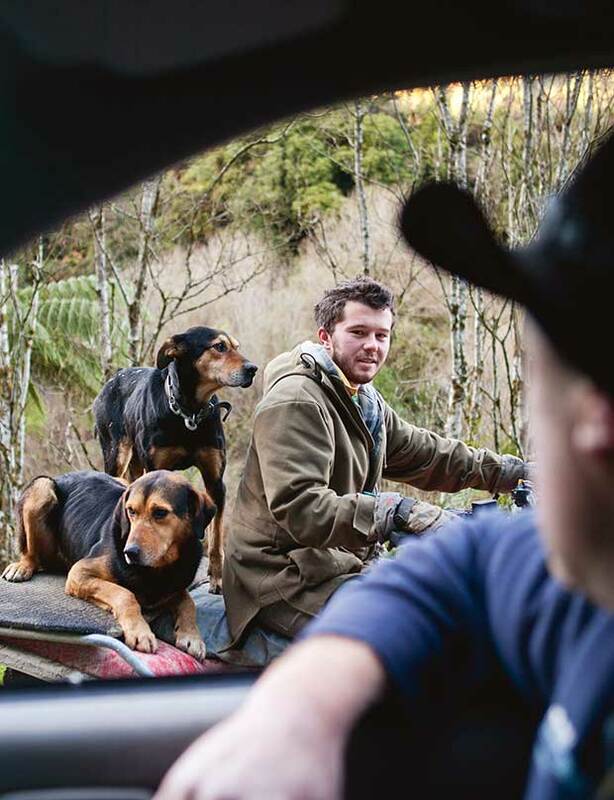 An international backpackers travel company approached Dan with the suggestion that its hop-on-hop-off Stray Bus should include Blue Duck Station en route from Auckland to Queenstown. It had heard about Dan’s eco-tourism venture on the grapevine. Love the bush and the back of beyond they did. Twelve months after the first bus pulled up in the autumn of 2011, Dan heard that Blue Duck Station had been voted the best spot in the country by the company’s young travellers. Blue Duck Cafe oozes with heartland ambience. These days Retaruke and Blue Duck Stations host up to 300 or 400 visitors each week, made up of Stray Bus visitors, hunters, canoeists, walkers, cyclists and nature and history lovers. “The early-morning view stops you in your tracks and you never get used to it,” says Dan on the ridge overlooking the Kaiwhakauka Valley. Amidst the hubbub of farming and environmental future-proofing, Dan has also squeezed in the most important passion of his life. 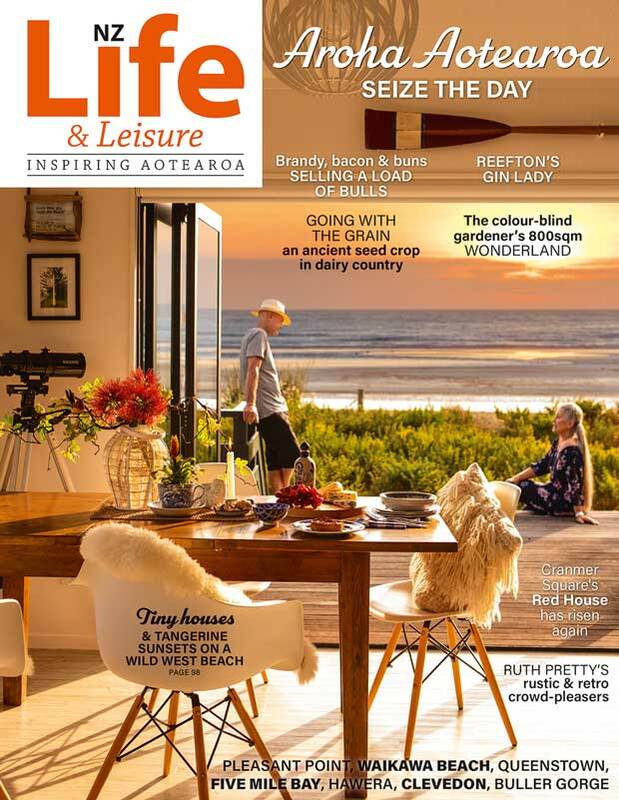 In three months’ time he and Sandy Waters – former student pilot from Pauanui, Auckland business-development manager and stiletto-heel lover, Spanish speaker, snowboarder, conservationist, marketing contractor, builder, plasterer and owner of Snowy Waters Lodge in Raetihi – will marry. 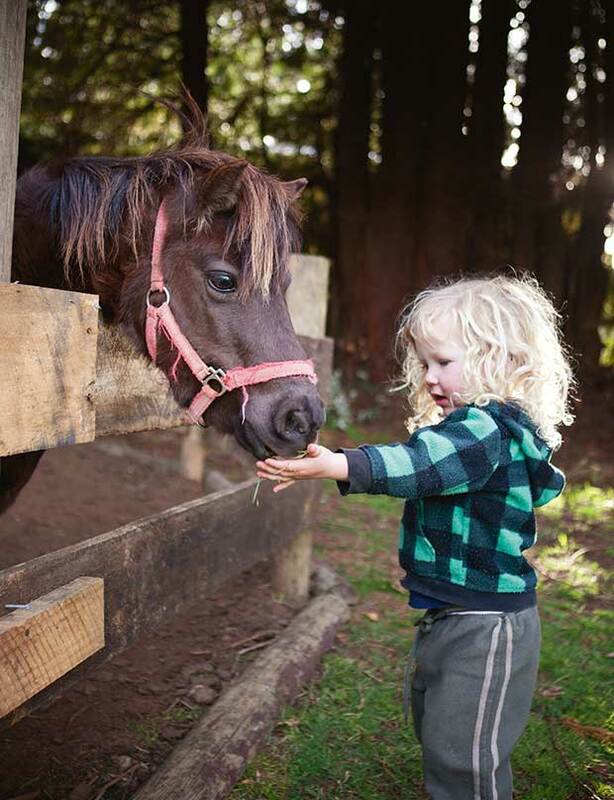 Blue and his pony Gypsy at Snowy Waters Lodge; the Depot building (circa 1919) was once the supplies store for those returned servicemen who broke in the rugged country at the ill-fated Kaiwhakauka settlement. Melted spatulas and embarrassing visitor-book entries aside, Dan and Sandy and their three-year-old son Blue (he was named Blueberry before he was born and his parents loved the shortened version once he arrived; Sandy’s maternal grandmother’s maiden name was also Blue) now spend their working week between their homestead at Blue Duck Station and Snowy Waters Lodge, Sandy’s guest accommodation venture in Raetihi. She bought the rundown building, formerly the nurses’ home for the old Waimarino Hospital, seven years ago when she was 26. The Depot building (circa 1919) was once the supplies store for those returned servicemen who broke in the rugged country at the ill-fated Kaiwhakauka settlement. The real estate agent tried to deflect Sandy’s enthusiasm by detailing the building’s foibles: half a metre of water in the basement, threadbare carpets, no heating, no driveway, thick moss growing over the roof, empty and no longer operating as a lodge. Dan and young volunteers have revived the building, replacing rotten boards with authentic hand-split timber. Word spread of Sandy’s arrival in Raetihi; she was offered a regional tourism role. During several years spent travelling the world she had honed her marketing skills with the De Vere hotel group in England. Scuba diving in the Red Sea, a spell in the South American region of La Pampa and an immersion Spanish-language school in San Sebastian had been sideline projects. But Sandy’s intrepid attitude to life is surely innate. “I had the best childhood I could have asked for. It was creative. We were a DIY family. Mum is a nurse but she’s also worked as a fork-lift driver, truck driver and bar lady and Dad, who’s a watchmaker by trade, can turn his hand to anything. 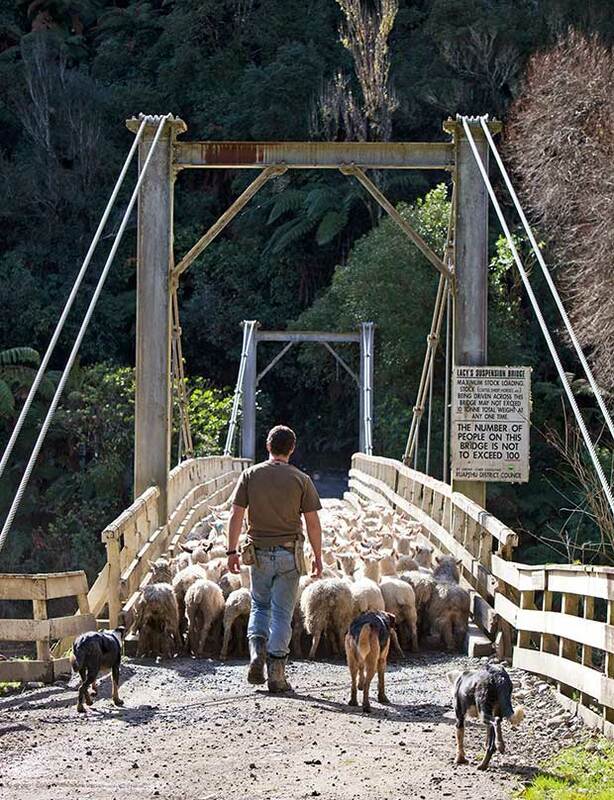 Retaruke Station stock manager Jaden Street from Napier and his team of dogs muster sheep across historic Lacy’s Bridge. While an hour’s drive separates Snowy Waters Lodge from Blue Duck Station, far more is shared between their respective owners than a whole lot of love and an endearing little boy with blond curls. In a “rubbishy, low-lying paddock” up the road from her lodge Sandy is leading the charge to clean up 60 years of abandonment. Dan and Sandy return from a jet-boat trip to the Bridge to Nowhere. 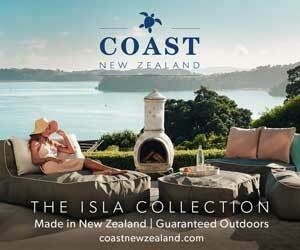 “The river was once the life blood of the central North Island. Now it’s a spiritual journey,” says Dan. She’s the voluntary eco-officer at nearby Raetihi Primary School. Forty-five locals with wheelbarrows and shovels and two diggers started the clean-up. The spinoff will be a a practical environment where students can learn first-hand about biodiversity and a cleaner Makotuku River which feeds into the Mangawhero River where blue ducks live. Behind the lodge Sandy is trapping rats and stoats to improve the habitat for a pair of karearea or native falcon living a stone’s throw from her front door. She’s experimenting with solar panels at the lodge, connecting them to the heat exchanger which provides hot water to the original radiators in each of the 14 guest rooms. 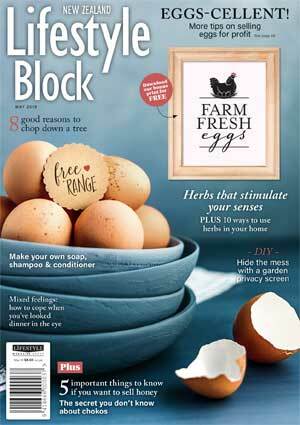 Although unfazed by driving a digger or unblocking a drain, Sandy says she’s not quite so competent in the kitchen. Which makes for a perfect fit with the man from Blue Duck Station. On a weekday morning at Sandy and Dan’s home coffee is served, Blue is rolling walnuts across the kitchen table and Richard Steele, Dan’s father, is recalling how his then-25-year-old son would phone from all corners of the globe to say, “You must never sell Retaruke Station”. A pair of blue ducks on the Kaiwhakauka Stream and gratitude for a wilderness valley at the bottom of the world were never far from young Dan’s mind as he traversed Europe. 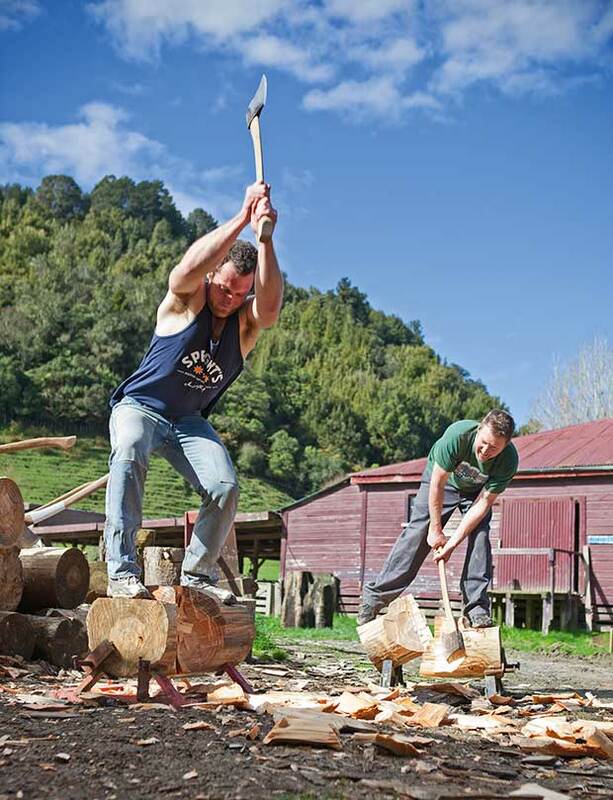 Wood chopping is a popular sport in the Whakahoro Valley, dating back to the days when the bush was cleared. Jaden and Dan show strong form on the blocks. The wood is pine and will be used as firewood. 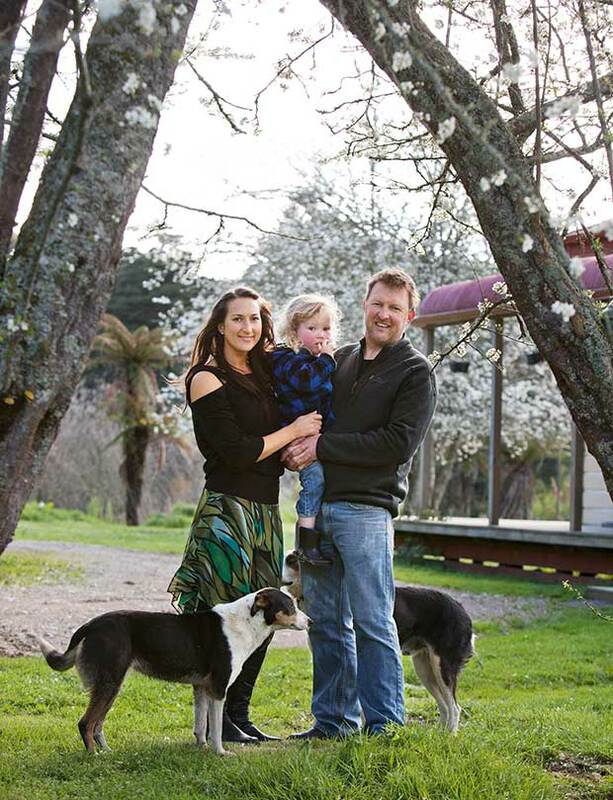 Fifteen years on Dan is heading out the door to check weta breeding boxes, muster sheep and take the jet boat down the Whanganui River to collect six canoeists from the Bridge to Nowhere. “Life’s a work in progress. You are born, you work, you die and it’s the bit in the middle that’s interesting,” says Richard. “Every day here is an adventure, even for an old crock like me.” For Dan and Sandy that “bit in middle” is chock-full of purpose and promise. Maggie relaxes at the end of the day; the café – the Blue Duck Station engine room. It took two years to make the old building habitable. 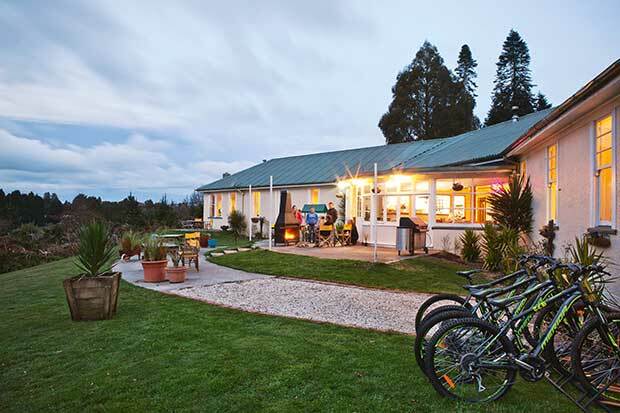 Snowy Waters Lodge is a key location for bikers cycling the Mangapurua Track and for walkers and skiers. In 2008 it opened as an accommodation and private-function lodge. Sandy runs a conservation and habitat-restoration project in the grounds. On Raetihi: “It’s so rich in history. It has the widest main street in New Zealand. Teams of bullocks used to tow timber down to the Whanganui River from one of the 11 mills in the area. 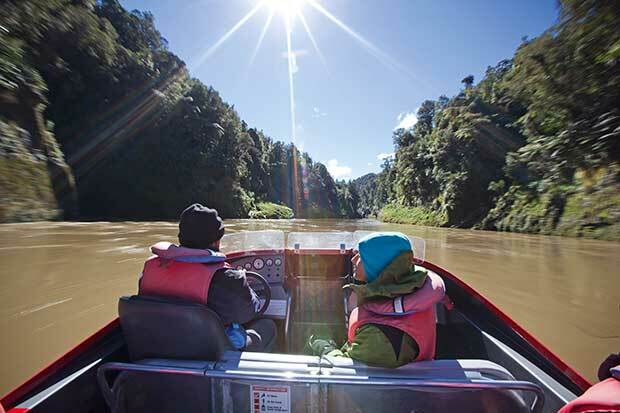 It’s an hour’s drive from Taumarunui and an hour up the Whanganui River by jet boat from the Bridge to Nowhere where World War I returned servicemen who tried to farm the area were defeated by the harsh landscape. Looking from Blue Duck Station across to Dan’s parents’ farm Retaruke Station at the confluence of the Whanganui and Retaruke Rivers. The concrete bridge (circa 1936) holds their story. Blue Duck Station contains historic tracks, bridges and buildings from that era. 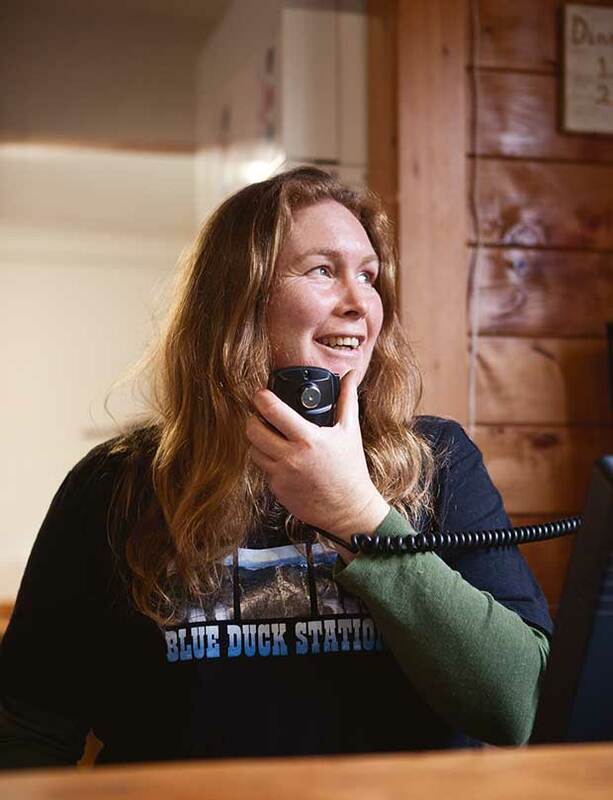 Blue Duck Station has won three Ballance Farm Environment Awards and a Department of Conservation Services to Conservation Award. 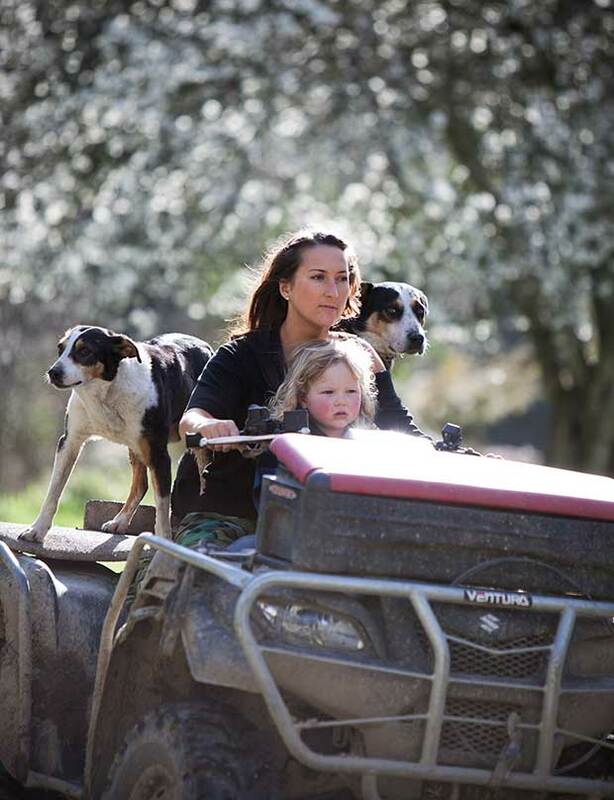 Wendi communicates with staff out on the station; Blue Duck Station shepherd Dan Bentley from Rotorua with his dogs Belle and Beau. EAMONN GRANT from County Donegal, Ireland, former café owner, now chef at Blue Duck Cafe: “Goat curry is my speciality. 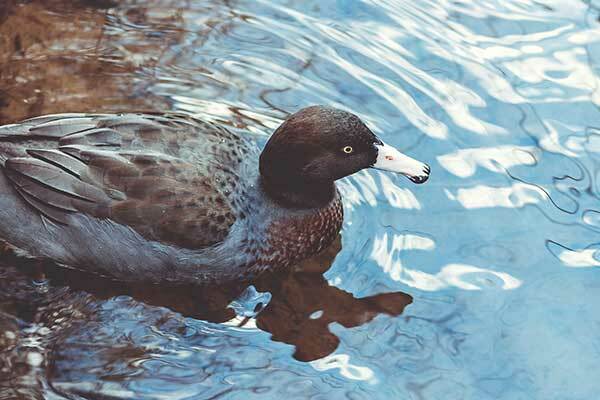 Whio is the Maori name for blue ducks which are classed as a nationally endangered species. They live in clean, fast-flowing, mountainous streams and are slate-blue in colour, blending with river rocks. They can’t be shifted to predator-free offshore islands because of their unique habitat. Their biggest threat is stoats which eat the eggs and kill the females sitting on their nests. Eight pairs of whio live on Blue Duck Station and 17 ducklings are known to have fledged at or adjacent to the station in the last breeding season. 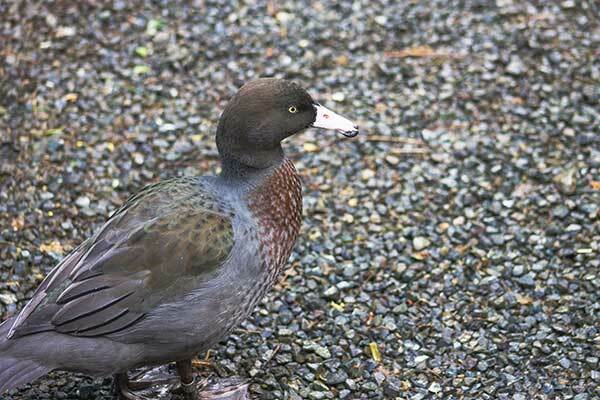 In New Zealand only 1400 pairs of whio remain. The station now also has 13 pairs of brown kiwi. Predator traps are strategically placed across the station to cover areas where whio live. In the past six years more than 5000 rats, 1300 hedgehogs, 260 stoats and 100 feral cats have been trapped at the station and its surrounds. In the winter months hunters kill goats, pigs and deer. Wild pigs are a threat to lambs as well as wrecking the bush. 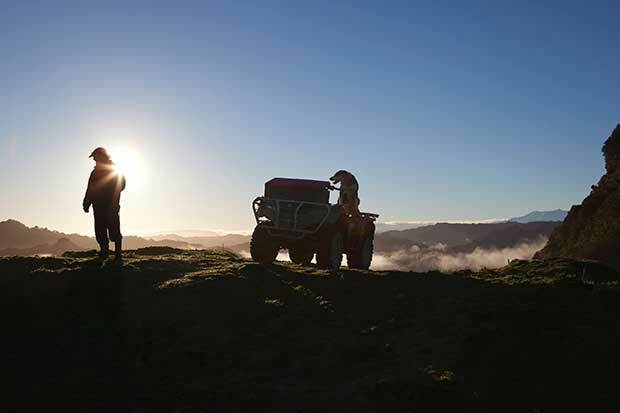 Two years after Dan Steele began his conservation work at Blue Duck Station his land was included in the large-scale Kia Wharite biodiversity project which is regenerating bush and birdlife in 180,000 hectares of the Whanganui River catchment. At Blue Duck Station you can sponsor a trap for $100. You are allocated a trap, have your name engraved on it and are emailed a trap number. You can check your trap’s progress and its latest kills using the Blue Duck Station Google Earth application. In 2007 Dan had five predator traps and 30 visitors a year. Now he has 450 predator traps and 8000 visitors each year.